Time to sell your condo in South Harbour? Read about today's resort-market buyer. South Harbour sits right on Little Sabine Bay, with a dock available for residents and visitors who bring their boats with them. Those staying in South Harbour enjoy majestic views of Little Sabine Bay, the Santa Rosa Sound, and the Gulf of Mexico from their own private balconies. The development is fourteen stories tall with seventy-two units, each of which has two bedrooms and two bathrooms. The outdoor pool is seasonally heated and enjoys views of the Bay. Go for a dip in the pool before sunbathing on the sundeck! There is a modern fitness center on site, with a sauna to relax in after your daily workout. Visitors to the gated community can enjoy the small private beach at South Harbour when they’re not exploring the rest of Pensacola Beach. Just across the street is the larger Casino Beach, with fluffy white sands leading down to the emerald-green Gulf of Mexico. If you’ve brought your boat and it is docked at South Harbour, you will enjoy admiring the pristine coastline of Gulf Islands National Seashore from the Santa Rosa Sound. 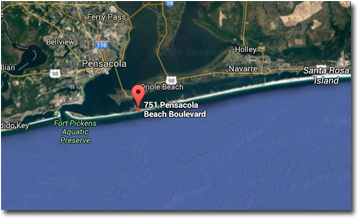 South Harbour is centrally located in Pensacola Beach, within walking distance of some of the best beaches and restaurants. Just across the street is the Pensacola Beach Boardwalk. Walk along the boardwalk with a cold drink and enjoy the invigorating sea breeze after grabbing lunch at one of the many restaurants on and by the boardwalk. If you want to grab something to eat back in your condo, Boardwalk Café is a local favorite that serves up burgers, sandwiches, and kabobs that you can pick up and bring back home or enjoy right there. Want a more romantic spot for date night? The Wine Bar is an upscale restaurant serving unique entrees, different wines from around the world, and local craft beers and is located on the Boardwalk. For a more casual date, the Sandshaker Lounge, right next to South Harbour, is the perfect place to let your hair down and enjoy live entertainment. With its scenic views, close proximity to the most exciting places in Pensacola Beach, and all the comforts of home, you’ll never want your time in South Harbour to end!